And here it is with the Samsung Gear S.
Apps working on the LG G Watch R. Calculator, Google Fit, Imperihome Home Automation, IFTTT, Instaweather, Google Keep, Tweetings, Play Music , Runkeeper and ViewRanger. These apps are apps I already had installed on my Note 4 that offered some android wear functionality. The apps all can display really nifty bits of info. The ViewRanger starts recording my tracks as I walk across Dartmoor. Runkeeper I can say start a run and it starts recording. If Google understands my voice I can create new tweets, emails, messages and more. Integrating with apps like Imperihome I can turn on the lights, open the garage and more. I can use Google Maps to navigate, set timers, alarms, show my my heart rate, show me my steps, start a run, workout, or bike ride, and take a note. I can have fancy watch faces. I have notifications including Google Now appearing regularly. Now the negatives. The watch feels and looks a bit cheap especially for a £200 plus watch. My wife conceded the Samsung Gear S looked better. It’s dreadfully uncomfortable so no matter what else I think I am returning it at the weekend. The ultra cheap leather strap doesn’t help. At the moment it’s poor as a heart rate and fitness device. It doesn’t continuously monitor your heart rate like the Gear S does during a workout. No point using it to monitor sleep as there is no method built in, plus the display keeps activating and is very bright. Too bright at times. My voice is not always understood correctly. There is no method to completely turn the display off. That means if you wear it at night, the screen will keep turning on. And it’s a bright screen! The Gear S has a do not disturb mode which is ideal for meetings and at nightime. I describe this watch as work in progress. With apps some of the options are incredible. With no Internet you have a dumb watch and nothing else. There is no on screen keyboard like there is on the Gear S.
Android Wear is the future but I just don’t like the uncomfortable fit and cheapish finish of the LG G Watch R. Plus the original G Watch’s rectangular face worked better than the R’s circular style. And being honest, I prefer the futuristic look and comfort of the Gear S. It has more purpose and works better at what it is built for. The Gear S is not the future but a watch is a piece of designer jewellery and it ticks that box as well. The G Watch R has future potential. The Gear S works now. 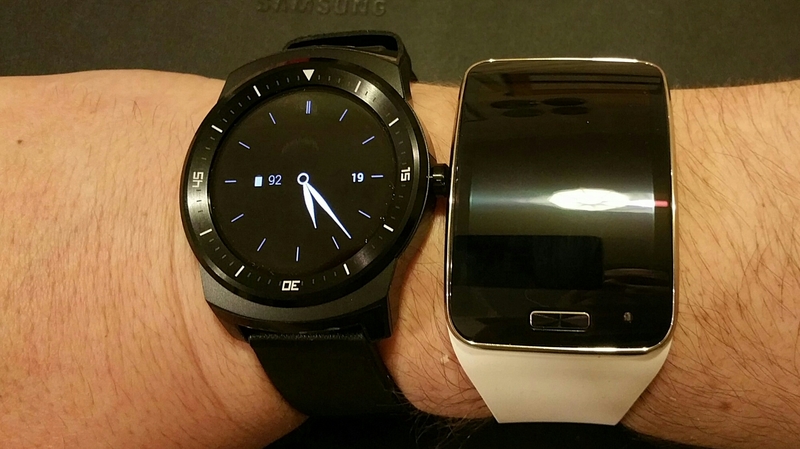 I was expecting to prefer the G Watch R over the Gear S but the G Watch R is just not good enough. 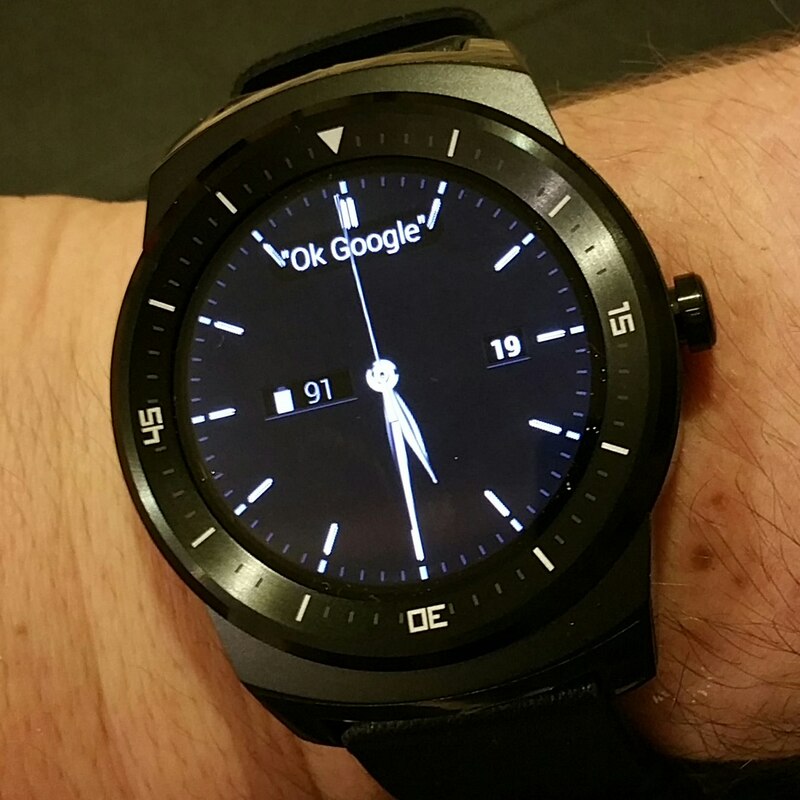 I would even go as far to say that you are better buying the original G Watch instead of the R.
Really useful review. Great comparison.